Flocculation powders are, amongst other things, suitable for treating wastewater after the preparation of water-based products (e.g. glues, adhesives, emulsion paints, water based varnishes, printing inks, etc.). This wastewater usually results from cleaning tools and equipment, and after cleaning systems when changing colours etc. (e.g. laminating metal, plastic, wood, cardboard, paper, etc.). For detailed information continue to our Safety Data Sheet in the Download centre. 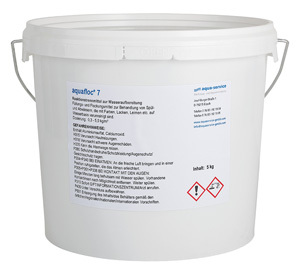 aquastabil* is a ready-to-use mixture for reducing the build-up of bacteria in water cycles. It is ideal to use when refilling a system, application depending on the volume of water as well as the temperature and frequency of use. Approx. 1 ml of aquastabil* is added per litre of water - for example approx. 80 ml for an AS 80. An extra dosage can be added after approx. 2 - 8 weeks, whereby the use of the unit and the environmental temperature play a decisive role. Long breaks or not using the system as well as a warm environment facilitate the growth of bacteria. 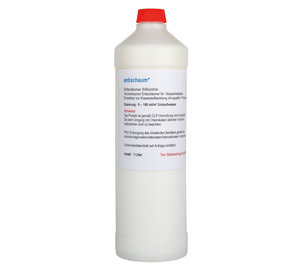 antischaum* is used to remove respectively reduce undesirable formation of foam during the water treating process. Depending on operating conditions, approx. 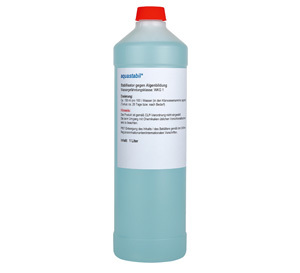 1 - 100 ml of antischaum* should be added per cubic meter of foaming media. Our anti-foaming agent has to be used undiluted. In each case the amount of antischaum* used should only be as much as necessary to remove the layer of foam.